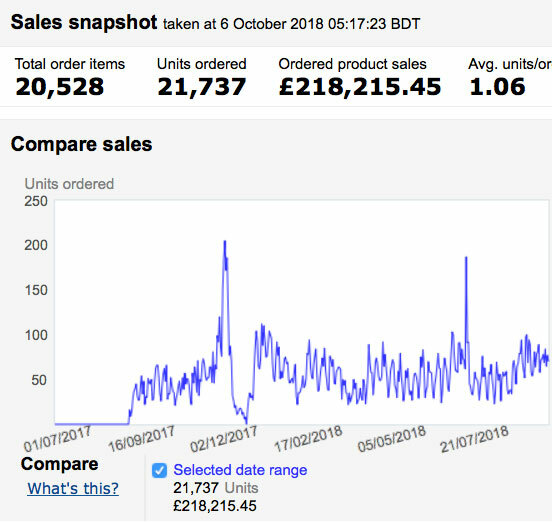 My September 2018 Amazon FBA Update: £22,215.97 in RECORD Sales! I don’t try to impress you with rented Lamborghinis and exotic holiday shots; I share an everyday, down-to-earth approach to the FBA business. The results I share can be achieved by anyone using my Amazon Sharks system since they are based on the reality of my business—not a fantasy! NO fake screenshots or photoshopped sales numbers from YEARS ago! All the information I share with you is factual, actual and 100% genuine. We’ll talk in more detail about Amazon UK sales later on, but for now, I thought it would be a good idea to change the structure of my monthly posts a bit. Going forward, each month’s update will start with a new section that covers the latest Amazon news, updates, any changes in the rules and so forth. Also, I don’t know if you have noticed, but there is another significant change this month. I have added a video version of the monthly blog post! Yes, I thought it would be great to create a video version to accompany the written version. Since there are so many visuals and images that I share with you in these posts, video format should work very well. I also know that many of you prefer video over written material and my presence on YouTube has been very minimal so far. Let’s hope I don’t get lazy and stick with this model. It would be great to continue doing a video version each month from now on! It does take a lot of extra time but, hey, anything for you, right?! There are a few changes that I want to quickly go over with you. First off, Amazon finished the changes to how the Advertising page looks and functions. They have also changed the name of the advertising platform, so it’s now simply: Amazon Advertising. Headline Search ads are now called “Sponsored Brands”. These are still only available to brands that are registered with Amazon’s Brand Registry. From a functional perspective, it has essentially remained the same. I have not noticed any significant changes here, apart from the visual graphs/reports with customisable settings that Amazon now provides. It’s all quite easy to understand and follow; the only thing I don’t like is the font size Amazon has chosen to use, which I think it looks too small. Then again, at least we have all the information available on one page, and you can always use the zoom function in the browser, right? 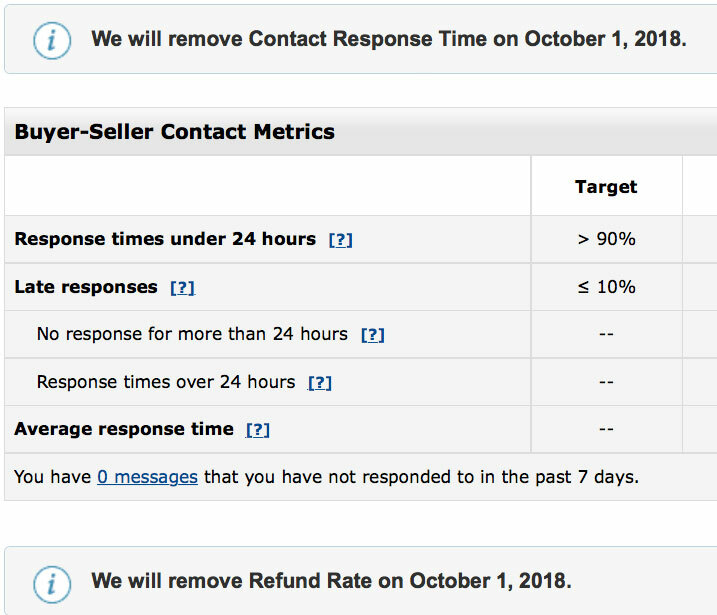 Another, more important change Amazon made just last week, on October 1st, is the REMOVAL of the Customer Response Time metric in the Account Health dashboard. Overall, they have changed the way Account Health, Customer Service Performance, Product Policy Compliance and Delivery Performance dashboards look. Now they look simpler and are easier to understand. 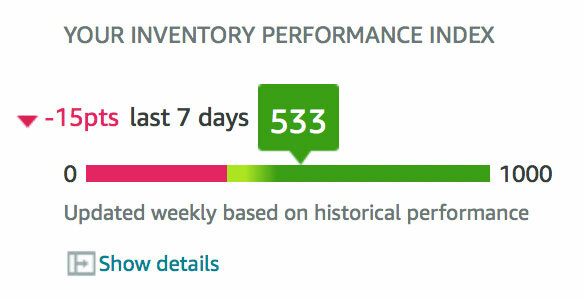 Getting back to the removal of Customer Response Time metric, I was actually sad to see this go because I was EXCELLENT at keeping this score perfect—less than one-hour response times on average. I have the Amazon seller app installed on my phone and have several pre-written replies saved in Amazon’s system. Since 99% of people just ask for an invoice, I send them a pre-written reply on how and where they can find the invoice in Amazon’s interface. Okay, I’m only joking about being sad to see this go! Going forward, I will probably turn off the notifications for the Amazon seller app as it can be annoying to get these messages on a Sunday morning or while you’re on holidays. As I said, an invoice request is not a super important matter, and I’m sure my customers will be fine with receiving an answer within 24 hours during the work week. Alternatively, they can take that time to look for the invoice on their own as it is CLEARLY visible on the order page! So, if Amazon no longer measures our response time to customer messages, what metric replaces it? Nothing. The Order Defect and Return Dissatisfaction rates stay in place, but Amazon has changed how they look and has narrowed down the timeframes that are measured. Any one of these can trigger an order defect. 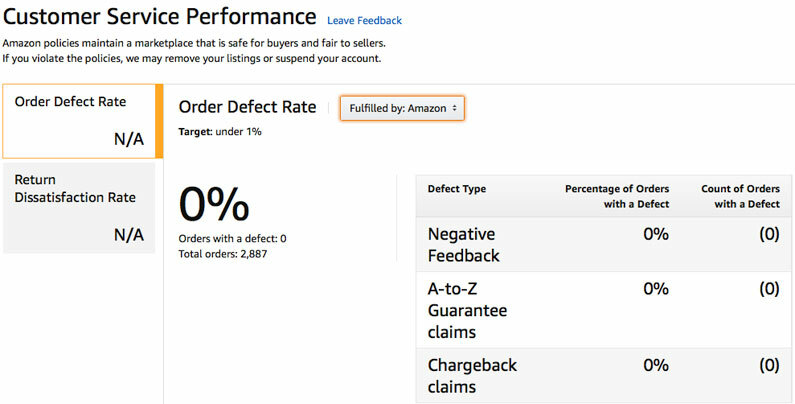 According to Amazon, if your defect score goes above 1%, your account may be deactivated (meaning suspended). I think if you sell a good product, describe it adequately and provide excellent customer service, you should have no problem staying below this 1% threshold. For me, for this account, with 16,000 units sold, I have yet to receive my first defect…. The second metric is Return Dissatisfaction rate. For those using Fulfilled by Amazon, this is irrelevant because Amazon deals with your returns. This is yet another reason why you should use FBA instead of fulfilling orders yourself. To sum it up, these changes haven’t made any negative impact. In fact, by removing the Response Time metric, we no longer need to rush or keep up with replies to customer messages on weekends and public holidays. I can honestly say that if Amazon made it simpler or more obvious for people to see where they can download the invoice, I would not receive 99% of messages I currently get—seriously. It would reduce my messages down to one or two per month, and that’s out of two thousand orders per month! While we’re on the subject of account metrics, don’t you like how this all looks? Just ZEROs everywhere, nothing else! This is the stuff I talk about in my “Why I moved from eBay to Amazon video”. If you haven’t already seen it, you can access it from my blog by signing up to my newsletter. If you’re selling a good product on Amazon AND use FBA for it, you won’t have any problems meeting the metric minimums for your account. In fact, as you can see, I have literally ZERO issues here! If I could change the date range to span the entire last year, you would see the exact same thing: ZERO complaints, ZERO issues with customers, ZERO everything! Something like this is simply impossible on eBay, where you constantly fight with very fragile metrics and can go “below standard” at any moment. I’ve been an Amazon seller for more than three years now and I can honestly say that it’s like night and day compared to eBay. Of course, things can go wrong on Amazon too. I have heard of horror stories, but so far, I haven’t personally witnessed or experienced any of that—and hopefully it will stay that way! The last thing I want to quickly talk about is the tax situation in the US. Long story short, the Sales Tax situation has been up in the air for quite some time now. But there is some good news! As I predicted in my Amazon US Expansion article, Amazon has simply started taking the matter into their own hands. Currently, individual states are issuing special laws and rules in relation to online marketplaces and how they should deal with Sales Tax. I really hope Amazon will continue doing this. 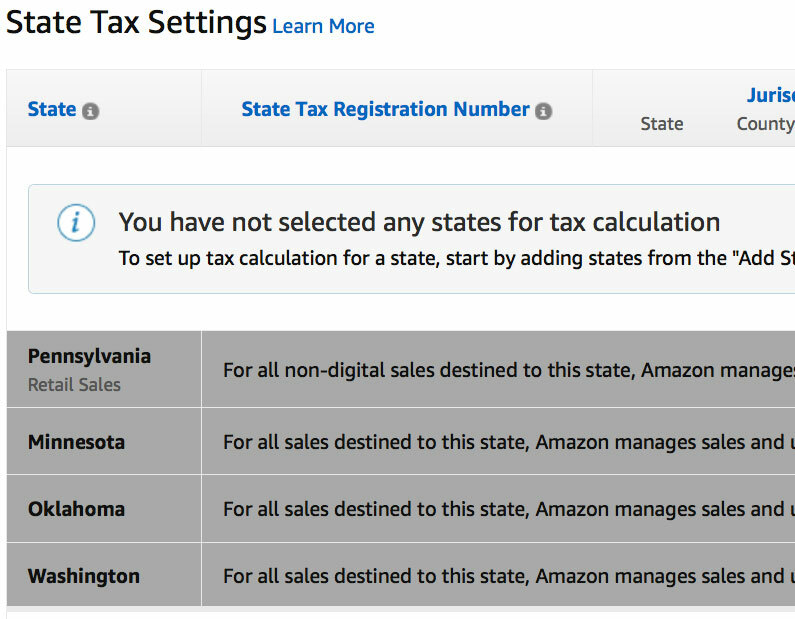 As these marketplace laws come into effect and more states are added to the list, it will free us completely from the uncertainty surrounding the US Sales Tax situation. We all agree that we should pay tax where it needs to be paid, but please do not ask us to register for tax in fifty states, create fifty individual tax returns, and maintain fifty regular payments. That’s simply not doable for small companies. 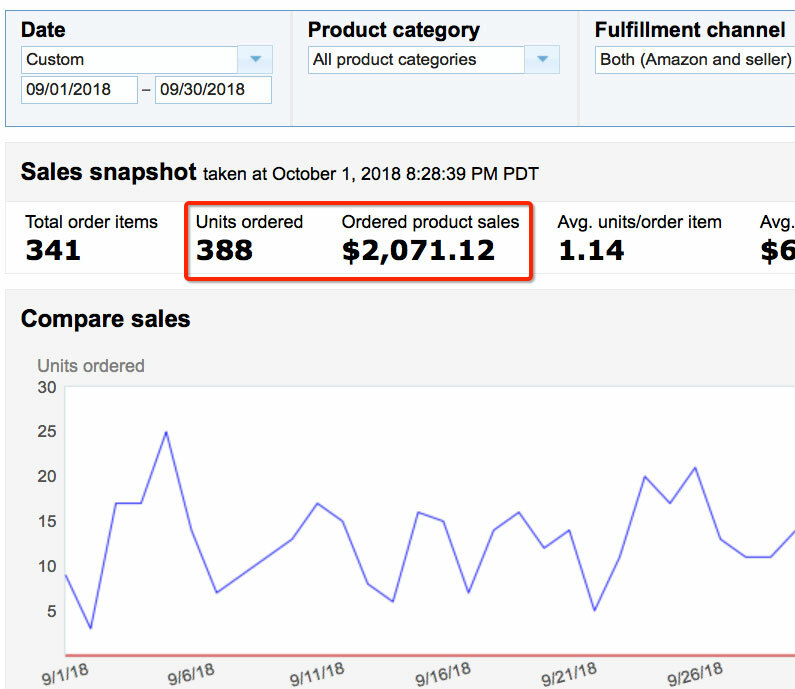 Ok, it’s time to dig deeper into numbers and see exactly how much money I made from my Amazon FBA business in September 2018! Let’s start with the UK side of things first. 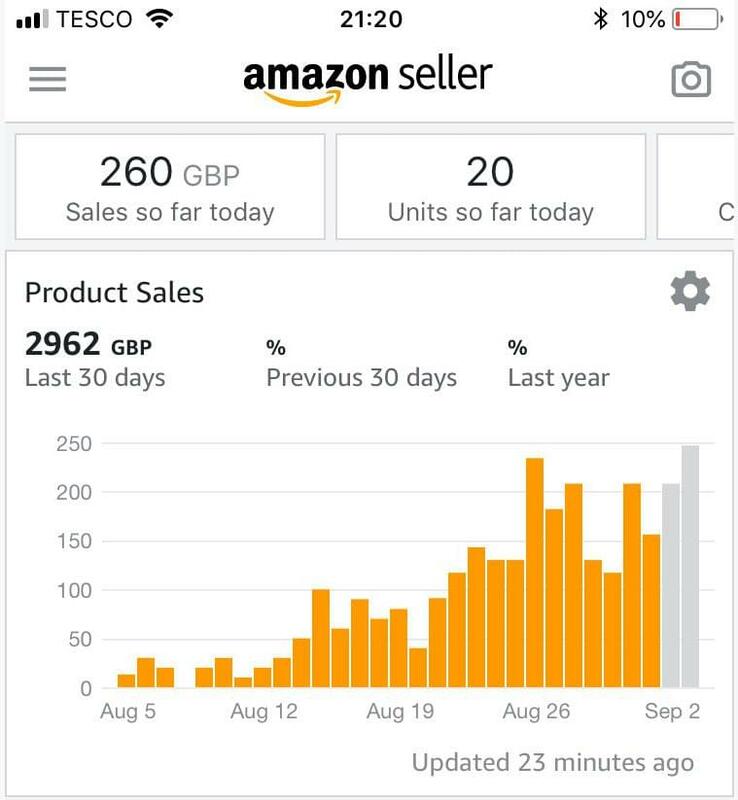 After an amazing July Prime day and sales of over £20k, August was unexpectedly slower at just £15k. However, September was another record month with more than £22k in sales. I was very happy to see that, right off the bat, in those first days of September, sales picked up significantly. As I previously mentioned, in the first two weeks of September, it looked like I would see a few 100-sale days, but that momentum did fade a bit. Hopefully, in October, we’ll see these 100-sale days come back and maybe even break new records as Q4 begins! We still have to do the maths! For those of you who are new to my monthly updates, you can go back and read the early posts where I explain the business, the product, the costs and profit margins. 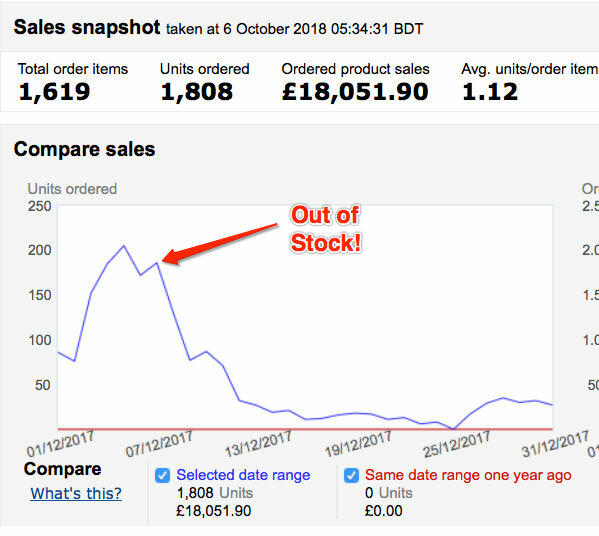 For everyone else, I will just remind you that after product costs, Amazon fees and VAT, I’m left with £4 NET profit per unit sold. And that’s the number I use in these monthly updates. Before anyone complains that there are returns, discounts and other adjustments to consider, yes, of course these numbers are not 100% accurate, and they’re not for accounting purposes. These numbers are just a snapshot of where things are right now for illustration purposes, and it allows me to show you my progress, easily do calculations and so on. So close to that £10k profit goal, right? Yes! 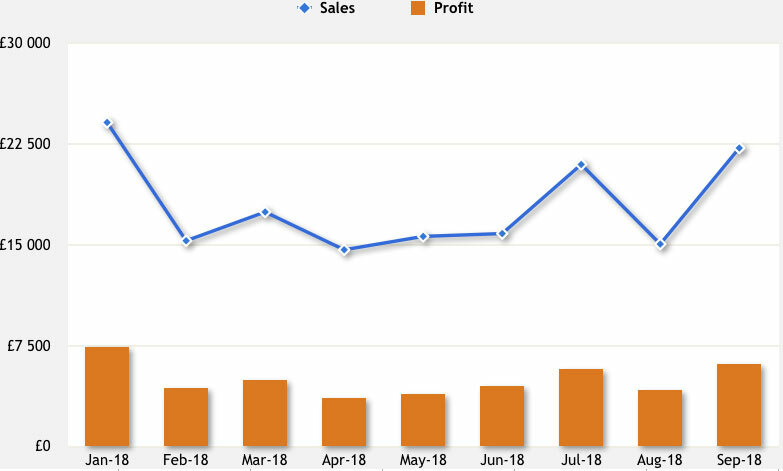 Unfortunately, that number still wouldn’t be my net profit because I also pay for ads on Amazon and will continue to do so for the reasons explained in previous updates (short version: to keep up sales velocity and improve rankings). However, now that I have been selling the product for one year and have earned quite good rankings—many first place rankings for major keywords and lots of Amazon Choice badges—I see that my spending on advertising naturally decreases over time. This means my sales increase but my ad spend does not increase proportionally. Heck, in September, my ACoS was 37.44%, which is the lowest it has ever been! Also, please note that I could lower it to 30%, 20% or even 10% by adjusting my bids, but I purposely don’t do this. I still want to have my ads shown all over Amazon, build brand awareness, increase sales velocity and get as many extra sales as possible. 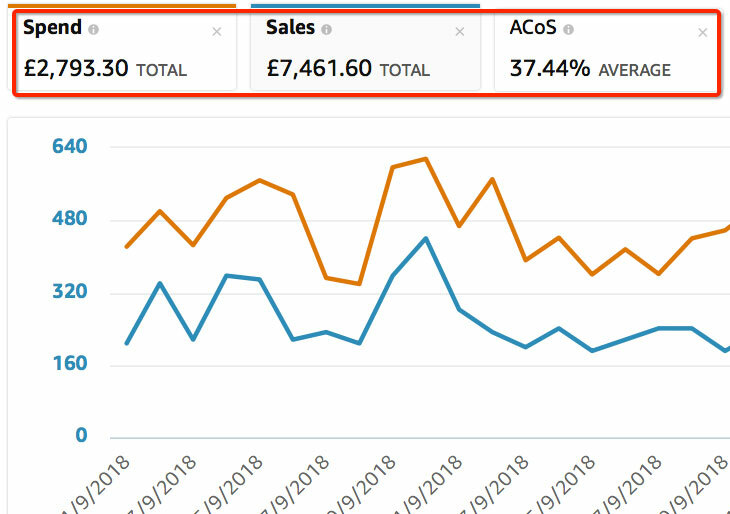 Going back to ad spend, in September, I spent £2,793.30 on both Sponsored Product ads and Headline Search ads, which are now called Sponsored Brands. Basically, we now have Sponsored Products and Sponsored Brands. I like it; it’s much easier to understand and remember, and it is all located in one place on the one-page dashboard. That’s a profit of six thousand pounds in September. Obviously, I do have an office and small warehouse space, so there are additional overheads that come off this number. However, again, I could just do this business from my home and not have any of those costs because using FBA means that Amazon takes care of all of that. 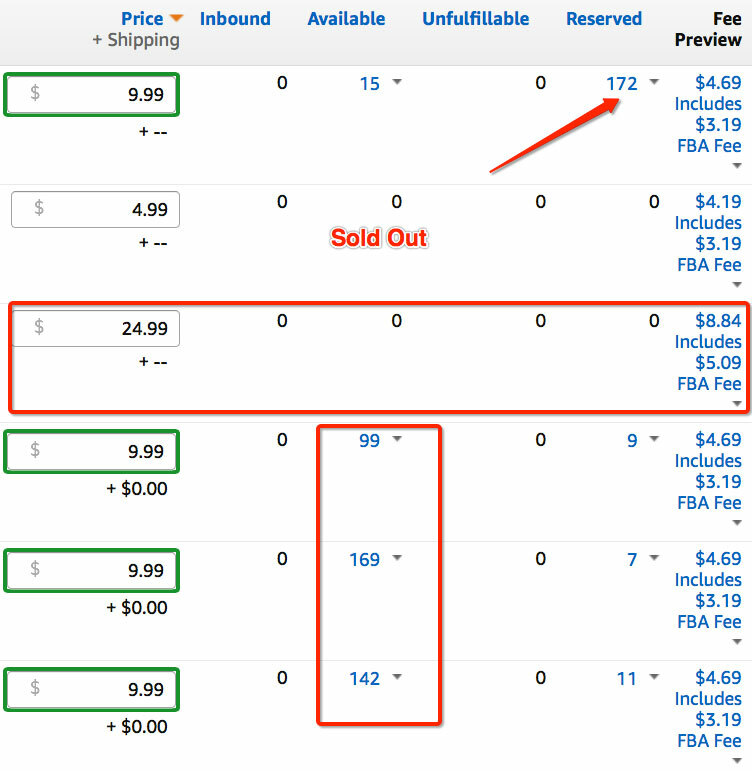 It’s why you pay Amazon that referral fee on each sale and FBA fees! 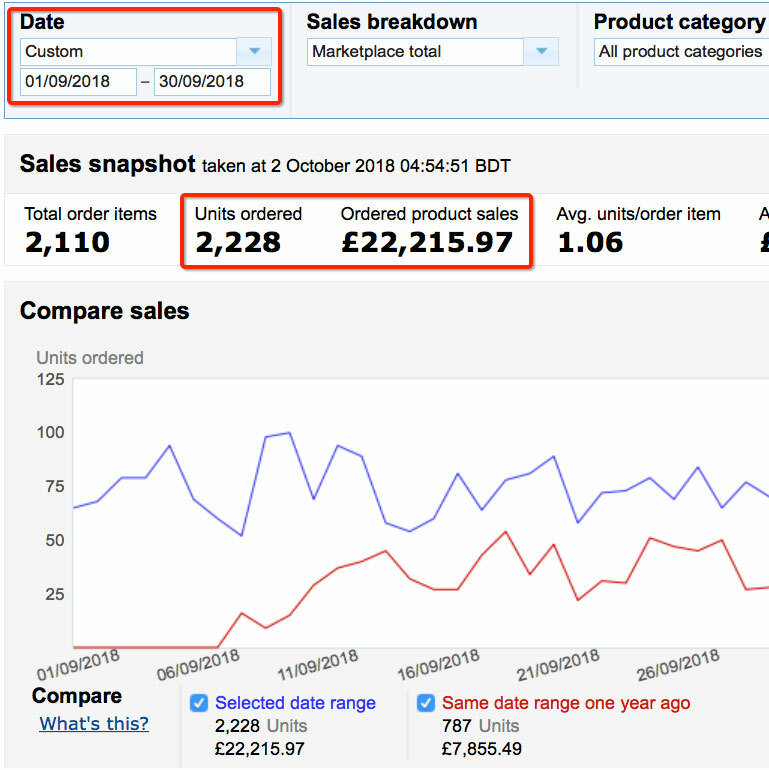 (Total number in Amazon reports is slightly different due to returns/refunds adjustments which can happen weeks after I have created my monthly reports and blog posts). We can’t see any clear trends yet, though. There’s not enough data and the year hasn’t even finished yet. However, it is quite evident that the winter months are much better than the summer months. If it wasn’t for the huge Prime week and Prime Day success in July, my summer sales figures would look quite flat. However, as I always say: you can only get a true sense of the trends when you have been selling for at least one full year. Then you have sufficient data to compare your sales with past dates and you can make more accurate inventory planning decisions. Take this year for example. I have doubled my Christmas stock level due to selling out so quickly last year. I just hope it will be enough to sustain the demand and I won’t run short again! But if I do run out, I will have new, updated data to work with, and I should be able to plan next year’s holiday season even better. This is where the patience part comes in. I think I will do a separate post on this as people still don’t get it. You need to be patient to achieve good results on Amazon. 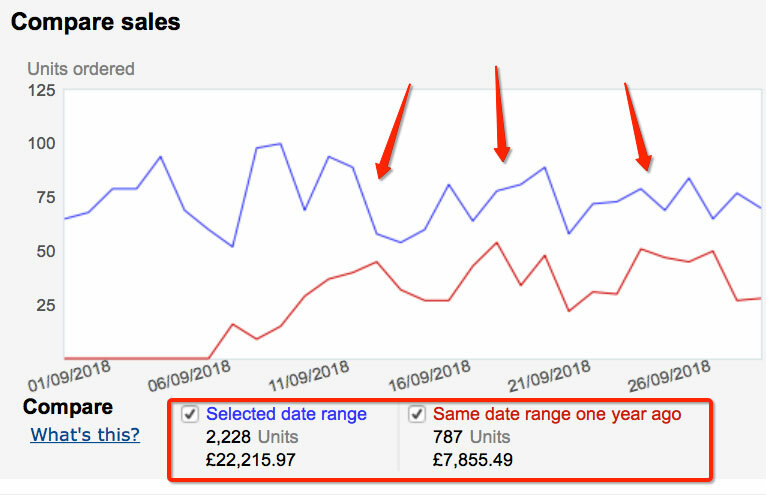 I have been selling for a year in this niche, and it is only now that I have secured top search positions (not all number 1s, of course) and steady sales from organic traffic. And this is a niche with relatively low competition. I would need to be much more aggressive with ads in a more competitive niche and maybe run my business at break-even for the first three, four or even six months until rankings and profitability are achieved. That’s how it works I’m afraid, so if you’re looking for overnight success, Amazon is not the place for you. There are always exceptions, like geniuses, pure luck and products with no competition. However, in general, it takes time to rank a product and get genuine reviews, so the one-year timeframe is actually a very reasonable period to look at. From now on, it will be really fun to compare sales data from last year. As long as I’m doing better this year, it means there’s still room to grow, right? Obviously, there’s a fixed size for any product and niche, but let’s not forget that every day more and more people start their online shopping journey, register with Amazon and make that first purchase. Last time I checked, online retail was still growing in the double digits each year, so I think we’re good for growth for many years to come! Ok, not much to talk about here—at least not yet! As I explained in the previous month’s update, I’m currently liquidating the stock I have listed on the Amazon US website. I’m basically trying to get rid of it all before the new product starts selling. More on that in a minute. 1) The Inventory Performance Index is going down every week. It has gone down from 588 points last month to just 533 today, and it continues to decline by 10-15 points every week. This is mostly due to the slow sell-through rate, which I explained in the separate IPI post. 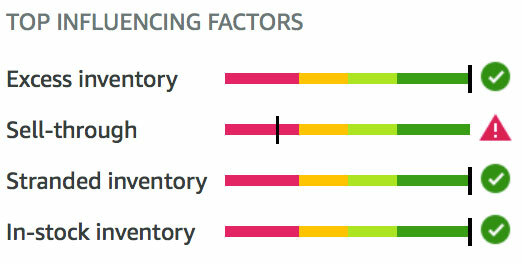 I definitely don’t want to undermine the chances of the new product by having an IPI in the RED, so, by quickly selling the inventory, I should be able to save my IPI score. 2) I can’t keep selling the OLD version at $4.99 when the new product arrives. The new product will sell for $24.99 and will contain three times more and will be three times bigger than the old product. Now, if I leave the old product selling for $4.99, it will make the new product look disproportionally expensive, right? Customers could buy three units of the old version for just $15 and get the same quantity, so the new product looks like a bad deal in comparison. I hope this does make sense. 3) To keep my numbers clean, I want to start from scratch with the new product. That way there’s only one price point, which will make my reporting for this blog easier. To keep things simple and straightforward, I will stop selling the old version of the product when the new version arrives. This means I can clearly report to you on how the new product is progressing month by month. To sum it up, the plan is to sell as many units as I can between now and when the new product arrives. After that, I’ll have the remaining stock removed by Amazon (meaning I’ll pay Amazon to dispose of remaining units). At that time, I hope it will be just a few hundred units left out of the 2000 I sent, so it’s not that bad. Hopefully, the new product will make it all worthwhile! But even if not, I wouldn’t change anything because the current version of the product simply wouldn’t survive on the Amazon US marketplace. Numbers-wise, 388 units were sold in September 2018, which resulted in earnings of $2,071.12. The majority of that money went to Amazon for FBA and referral fees, but I did get two payments of a few hundred each into my bank account. Well, not my actual bank account—my Transferwise Borderless account. Yes, last month I changed the bank account on my Amazon US account to a Transferwise Borderless account. Why? To save on fees, of course! Specifically, to get a much better currency exchange rate than Amazon or my local bank offer. Transferwise gives us the ability to use near-market rates, meaning we can save quite a lot of money, especially when the sums transferred are in the thousands. You can read more about how Transferwise can help your Amazon business save money on transfer fees here. An interesting thing happened when I made the switch: Amazon’s algorithm instantly spotted this as a potential account hack, removed the payment details from my account, AND locked down my listings. They also sent an email to inform me that my account had possibly been hacked. I know that many people would get angry over this and go onto the Amazon forums to complain that Amazon is the devil and what not. Not me. I was pleased to see that they have such stringent security measures in place to protect my account, even though the chances of my account being hacked are very, very low. While I do use two-factor authentication, it’s nice to know that if things go south, Amazon will protect my account. The trigger for this security warning was obvious: an account from Europe, using a European bank account suddenly changes to US bank account. It does look like an account hack because if someone hacks your account AND changes your bank account information without you knowing it, the next settlement payment will go to that new bank account. This is something that has happened to people in the past—back when there was no option for two-factor authentication—as all it took to hack your account was to steal your password. All I had to do was log back into my account, change the password, confirm my original bank details, then everything was unblocked and I was all set up with my new Transferwise Borderless account details! I just wanted to share this experience as it could happen to you too. If it does, you shouldn’t panic or be scared—just follow the procedure laid out by Amazon and you will be back on track within 10 minutes. Ok, I know many of you are waiting for the new product to be launched on the Amazon US site, so when will it happen? What’s the latest? Let’s find out! Yes, I’m super happy and excited that I was able to make this move so fast! I created a new product, new packaging, images, description, and even a video for a brand-new product in a relatively short period of time, even though lots of things were happening on other fronts too. For example, I’m actually struggling a bit with stock management for the UK side of things because sales in October have really picked up. I have variations that have already sold out and others that will sell out soon, so I had to manage this at the same time as working on the new product and with everything else running at a limited capacity. But it’s all good, of course! It’s part of the process! A bit of stress makes those dollars earned even more valuable, you know? So, the first shipment of 600 units is on the way to the US. 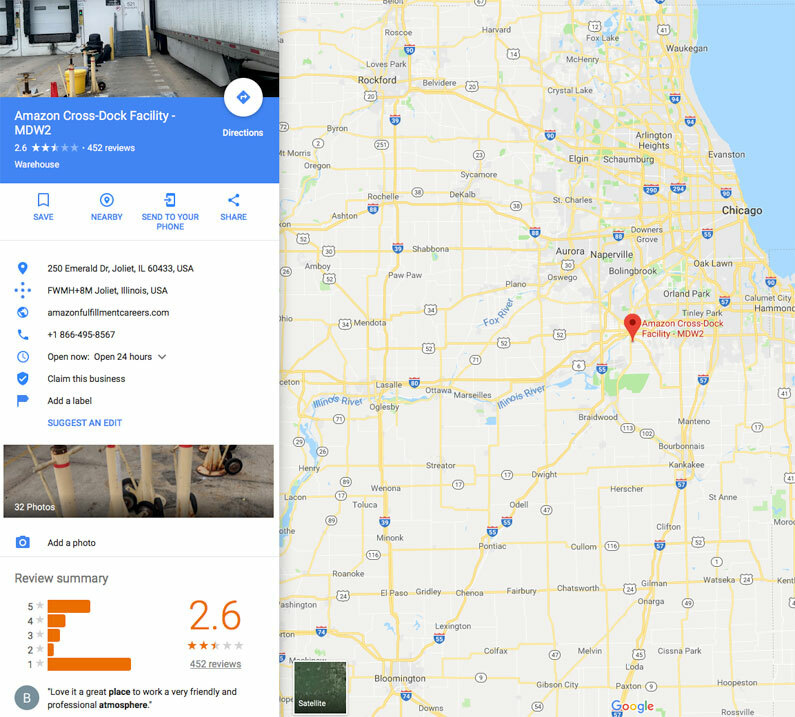 It’s going to Joliet—an Amazon FBA centre near Chicago—which is the same one my first shipment was delivered to. According to Google, it’s NOT one of the best out there! 🙂 Yeah, those reviews make for an interesting read… but it all went well the last time, so hopefully that will be the case this time too. Especially since I’m sending a full pallet of just one item. There’s very little that can be mixed up with that. Obviously, it’s tough to tell how the listing will start off, how well PPC works, etc., but my plan is to sell those first 600 units within two months or so, which is an average of ten sales a day. However, that is a wild estimate. It really depends on a number of factors, including how quickly I get my first reviews in as I will be starting the listing from scratch, won’t use any friends, etc. for the first reviews. I want to share this process with you to demonstrate exactly how it is, with no privileges. I have another 600 units in my warehouse that are ready to ship out as soon as I see the first week’s sales results and can make an approximate guess about how long the first pallet will last. And there’s more stock on the way too! I used air freight for this first shipment and will continue to do so with a couple more, even though it is expensive. It just gives me the speed I need right now, but in the future, when the product and listing are established, I plan on switching over to sea freight as it is not wise to pay so much money sending pallets via air freight to the other side of the world. I think we’ll get to exact numbers, costs, fees and everything else in next month’s update. By that time, I hope that we’ll already see some initial sales coming in and then the numbers will make more sense. And that’s it for today! I hope you have enjoyed this update and are benefiting from the new, slightly longer format of the posts, which allows me to explain everything in a little more detail. The additional video should also be helpful for people who prefer to learn in a more visual way. I say “learn” because, apart from just sharing my progress updates with you, I also try to fit in bits and pieces of relevant information that can help you with your Amazon business. I also share the latest Amazon changes in rules, which are crucial to keep up with! So, if you continue following my monthly updates, you will stay updated for sure! If you would like to learn even more, I have to take this moment to pitch my Amazon FBA training program. 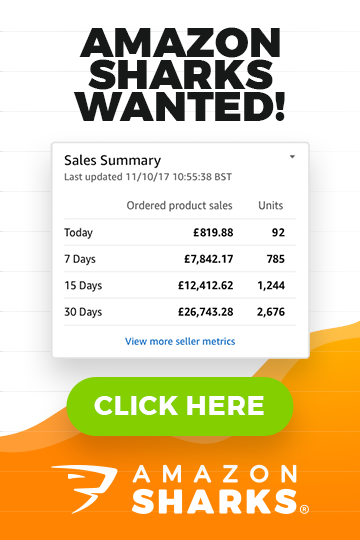 I’m super excited to have received even more testimonials and case studies from early Amazon Sharks students who have already reached great sales numbers and are making steady progress on their FBA businesses. 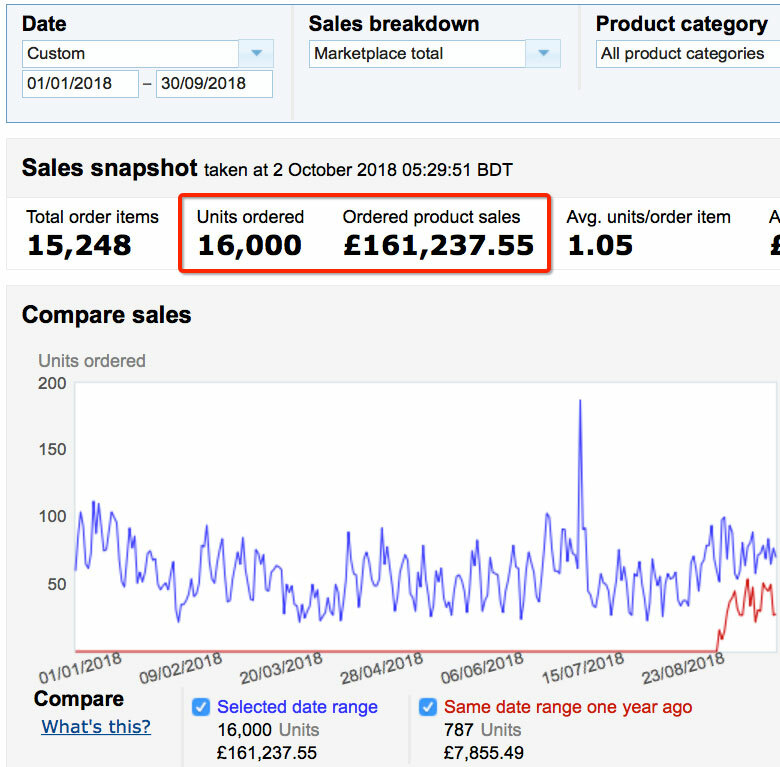 If you are interested in getting started with your own Amazon FBA business, you can watch the video on the Amazon Sharks website where I explain in detail what the course is all about and how you can use it to build your own successful Amazon FBA business in the UK and abroad. Ok, as always, if you have questions about anything I have covered today, feel free to leave them in the comments section below. I am more than happy to reply to them. 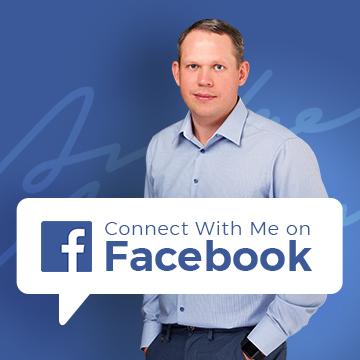 I personally reply to almost every comment on my blog and social channels, and I am really enjoying answering your questions every day. I look forward to seeing you all next week on the blog and then next month via the blog and YouTube video when we’ll talk more about my Amazon US launch! Just discovered your blog. Some good content. can be skewed causing you to base your decision on corrupted data. Amazon is no doubt a great platform and I only saw a paragraph in glancing about how having your own website can’t compete with Amazon and Ebay. I haven’t been through all your posts and you may have touched on the subject already but where there are pros, there are always cons and Amazon is no exception. Yes, of course – there are risks, there are problems on Amazon too. But the reality is that platforms like eBay & Amazon are still the best/easiest way to start out. You can really make it happen on Amazon even if you have no prior experience in eCommerce or business at all. Because the customer is already there. With your own website, you have to get that customer to come to your store and buy. And that’s a mission impossible for many, many people out there. This is fantastic news! Another smashing post. You deserve the very best and the best of luck! I am proud to be part of Amazon Sharks. All the best to you and your family. Thanks again, for all your help as always.